Pepperoni Pizzeria (Frankel Avenue Outlet) – Possibly the Best Pizza! Go to any online forum with a discussion thread on “Where to find the best pizza in Singapore?” and I’m absolutely positive the name Pepperoni Pizzeria will pop up. 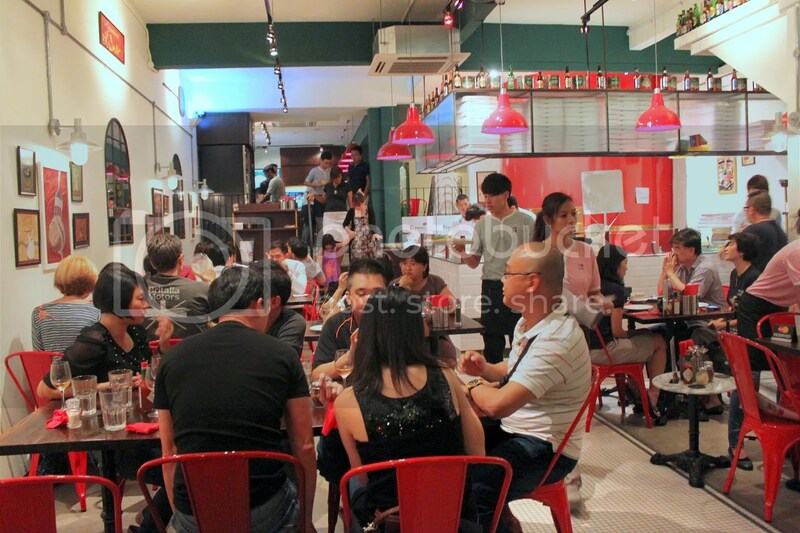 Operated by the Les Amis Group, Pepperoni Pizzeria‘s Frankel Avenue outlet is the newest of their 3 outlets, the other 2 being located at Binjai Park and Greenwood Avenue, both around the Bukit Timah area. 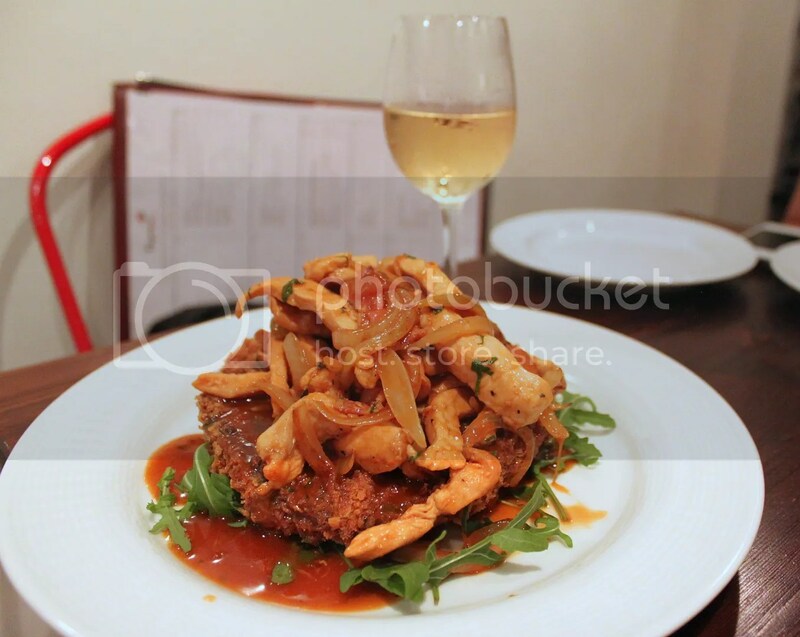 Given the popularity of the place, reservations are highly recommended. 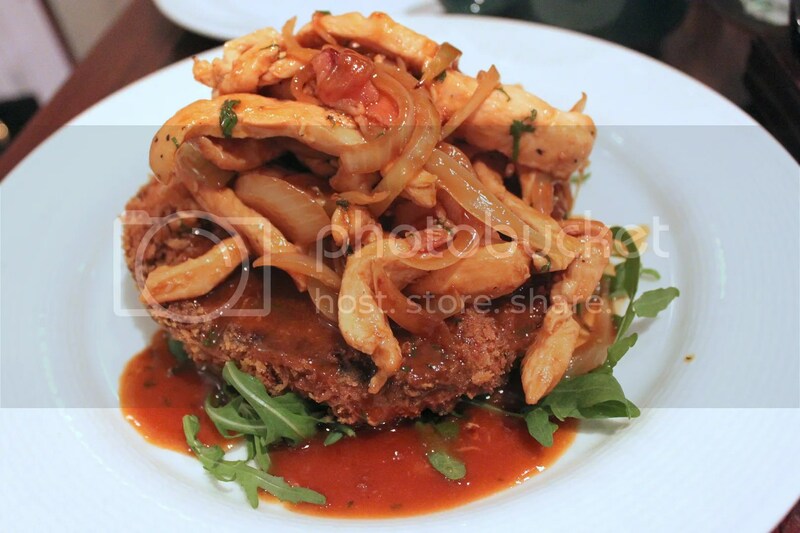 If there’s one appetizer worth ordering here, it’s got to be the Fried Potobello Mushroom with Chicken & Red Wine ($18++). With a portobello the size of both my palms combined, the fried batter manages to remain crisp despite the excessive local humidity. The red wine sauce is spectacular, rich, fatty and robust and comes with diced bacon, just my kind of gravy. The Aglio Olio & Peperoncino ($18) or Spaghetti tossed with Garlic and Red Chili in Olive Oil is awesome as well, though priced rather steeply for something so simple. The garlic isn’t that intense despite it’s chunky look and the spiciness is well tuned. 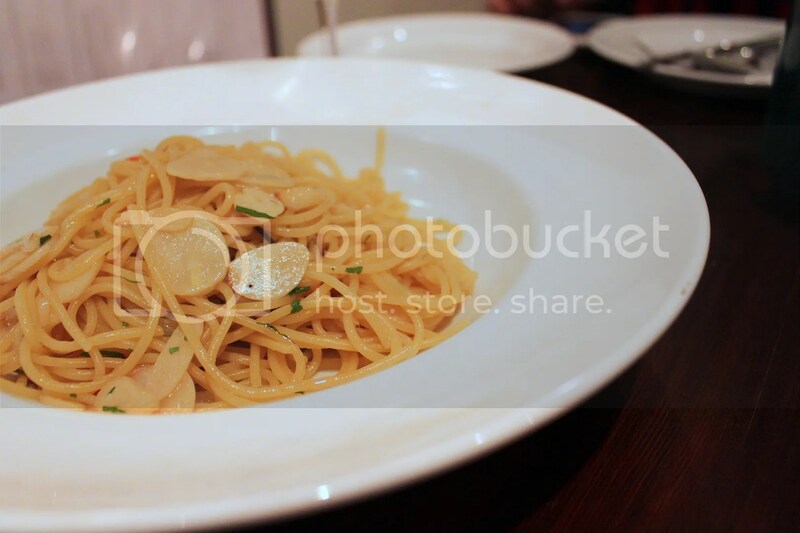 Feedback from friends HH and JH is that the other pasta dishes available here pale in comparison, so I’d suggest sticking to the Aglio Olio if you are a first timer here. The Pizzas here are thin-crusted and come in 3 main sizes, Medium (9 inches), Large (12 inches) and Family Size (21 inches). Personally, apart from the novelty factor of having a crazily huge pizza,there really isn’t any perks in ordering a family size since it will typically be less evenly cooked. 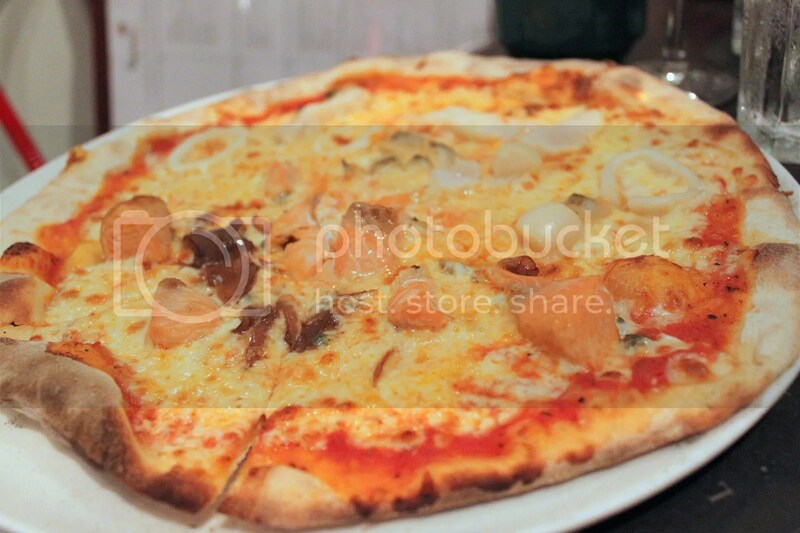 Hence, we ordered a large Salmon (Fresh Salmon, Caramelized Onions & Capers) and Frutti Di Mare (Prawns, Clams, Scallops, Squid Rings & Fish) Pizza ($23++). Yes you can have your pizza half and half here 🙂 My favourite pizza at Pepperoni’s is the salmon, whose flavour has somehow been infused within the pizza. Not sure how they do it but it’s devilishly good. 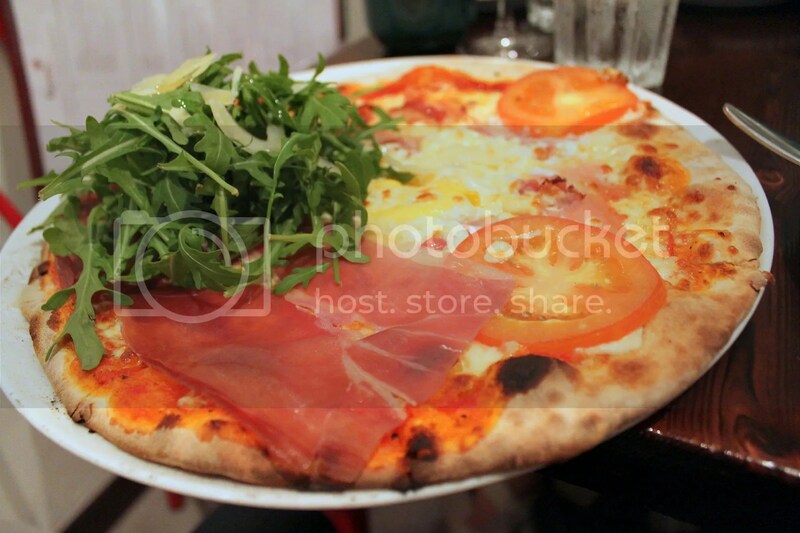 If you prefer your pizzas on the salty side, go for the Pancetta (Pancetta, Diced Tomato & Soft Egg), Prosciutto Crudo di Parma (Parma Ham & Rocket Salad) ($23++). So is Pepperoni the best Pizzeria in Singapore? Very possibly, I’d say. 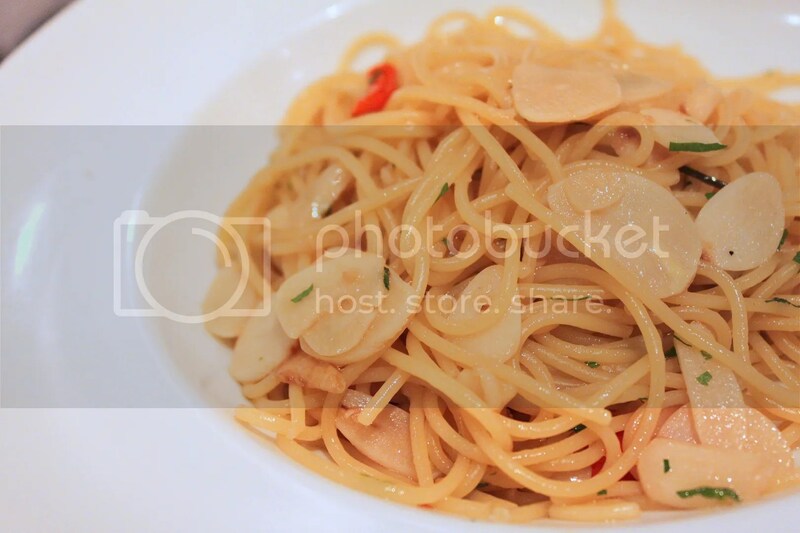 Categories : All YumYums in my TumTum, Cuisine Type YumYums, Italian, Kembangan, Location of YumYum, Western, Yummy! Yes, I agree with you that it’s the best in Singapore! Their Prosciutto Crudo di Parma is real good! I third this! I’ve been to the Brinjal Park one and the pizzas are superb. its been some time but i remember spizza being pretty good as well!